Both of these scenarios can be problematic to scale-up/ process chemists when other, non-chromatographic purification techniques are not successful. When this happens, either a different synthetic route or extraction process is needed or large scale chromatography is employed. In this post, I will explain how flash chromatography can be successfully scaled while minimizing time and solvent consumption. Let’s say you have just received a request to scale the synthesis or extraction of a compound that appears to have great commercial value and you need to determine the best way to accomplish this while minimizing costs. You try crystallization and perhaps distillation but they can’t/don’t provide the required purity levels and are time inefficient. Now you need chromatography. You prefer not doing chromatography due to the need to spend time (and money) developing and optimizing the method, but it appears it is the only viable option. How do you perform large scale chromatography quickly, efficiently, and at minimal cost? Well, a few options exist. In most cases, chromatographic scale-up is linear. This means that whatever amount of crude sample you purify at small scale can be directly scaled to accommodate the newly synthesized mass at the same crude-to-silica weight ratio. For example, if your crude, scaled-up batch is 100 grams and you successfully purified 500 mg on a 10 gram flash column (a 5% load), then a 2000 gram flash column is required to purify 100 grams (100 g / 5% = 2000 g). An important note here to ensure chromatographic success, you’ll want to maintain the same sample concentration (mg/mL), load percentage (e.g. 5%), elution gradient (starting/ending solvent % and gradient duration in column volumes), and solvent linear velocity. You can also benefit by calculating the scale-up factor, which is simply the ratio of the synthetic batch size by the purification sample load at small scale. Using the above example, the batch size is 100 grams and the small scale purification was 0.5 grams so the scale factor is 200. Simply multiply the scaling factor by the small-scale purification column to determine the required larger scale column size needed to perform the separation. Table 1 provides scaling factors for cartridges 5 grams and larger. While this methodology works, it may not be optimal from a solvent and time consumption perspective. To explain further, Figure 1 shows the linear purification scale up of a 5-component sample at three scales using identical 13 column volume (CV) linear gradients and appropriate scaling factors. Figure 1. Direct scale-up of linear gradients provides identical separation and linear scaling based on column size. To ensure the same mass transfer kinetics, linear velocity was maintained for each column size. The only parameter not linearly scaled up is flow rate. To ensure the same sample mass transfer kinetics, flow rates were changed in order to maintain the solvent linear velocity. Because linear gradients do consume a lot of solvent, optimizing the purification procedure is needed and is critical to the project’s and product’s success. By optimization, I mean isolating a maximum amount of targeted compound as quickly as possible at the highest allowable load using a minimum of solvent. A good scale-up strategy to achieve that goal uses either an isocratic elution with early run termination (ending the run just after the target finishes eluting) or a step gradient with a built-in column flush. The use of high performance columns (smaller particle, larger surface area) increases sample loads thus improving throughput and should be considered in scale-up projects. Purify the sample at the needed scale making sure I maintain equal linear velocity by adjusting flow rates! The benefit of this approach is a dramatic reduction in time and solvent, which reduces the cost of the final product, Figure 2. Figure 2. A step gradient created from a linear gradient and high performance silica reduced solvent consumption and purification time while providing the same linear load increase. 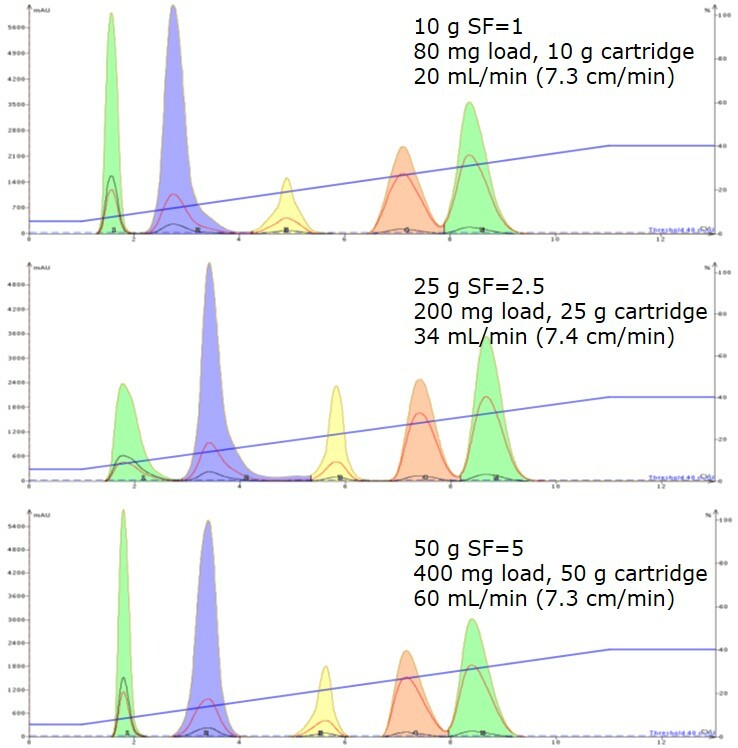 In this example, 150 mg was purified on a 25 um, 10 gram cartridge in 221 mL (4th eluting compound targeted) but when a step gradient was used on a 25 gram 25 um column, load increased to 375 mg but required only 300 mL to accomplish. 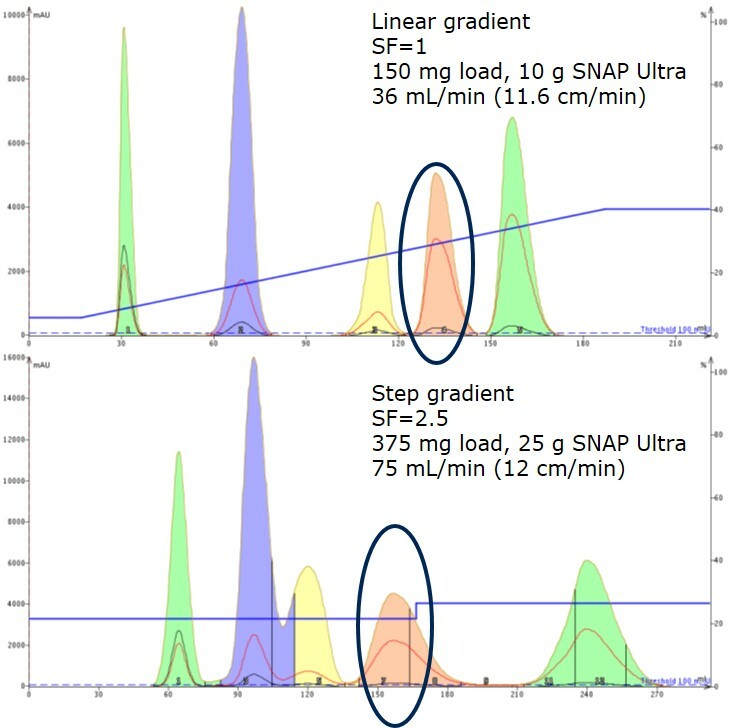 A 10 gram Biotage® SNAP Ultra cartridge with a linear gradient (13 CV) consumed 221 mL and 6.1 minutes to purify 150 mg of sample – a rate of 0.68 mg/mL or 24.6 mg/min. The Biotage® Isolera system I used converted the linear gradient to a step gradient. Scaling the purification 2.5x, a 25 gram SNAP Ultra column purified 2.5 times the amount of sample (375 mg) but in only 4 minutes and consumed only 300 mL of solvent with the step gradient. Purification efficiency improved to 1.25 mg/mL (from 0.68 mg/mL) and throughput increased to 93.75 mg/min (from 24.6 mg/min). Scaling the purification using the linear gradient would not have improved the productivity. Using a step gradient for this scaled-up purification increased the method’s efficiency and decreased its costs substantially. If you are wondering, the same approach is useful for reversed-phase purification scale up as the same principles apply. For my work when a compound is made and purified on a large scale there isn’t usually an array of peaks as in your examples. Usually it’s one precious peak to be isolated as pure as possible from closely eluting impurities. It will have been done before on a smaller scale so I should have a good method already. The method of choice will aim to elute my product isocratically after 4 CV then ramp up the %B just in case. Crude material is dry loaded and the start point will contain greatly reduced B for 0.2CV, to displace the air before increasing over 0.1CV (quickly as possible) to the isocratic level and held there for 4CV. Sounds like a nice, fast method. How often is the 4CV target attained? If I’ve done a TLC in hexane/EtOAc and the Rf is 0.25 then I hope that it will elute at 4CV. Of course TLC is far from perfect but it’s quick and gives me a ballpark figure. Sometimes the peak comes off earlier than expected, sometimes later but the isocratic hold for 4CV does the chromatography a power of good. Of course the column is massively overloaded so there is “fronting” and most peaks appear to come off faster than expected. Of course I’m trying to simulate the old prep hplc technique of liquid loading and isocratic elution but with the advantage of solid loading. Thanks for sharing your experiences. As you know, as load increases, the media’s capacity to retain it decreases and the solutes move further down the column which sacrifices purification efficiency. Dry loading, as you mention, improves loading capacity greatly vs liquid loading. Previous Previous post: How can I rapidly remediate THC from CBD in my hemp extract using flash column chromatography? Next Next post: How does solvent choice impact reversed-phase flash chromatography separations?